← From the Archives: Does it Matter? Letters like these from Christian believers in Cuba arrive in a steady stream at the editor’s desk of the official Spanish-language magazine of the Church of God. Named for its English forerunner, The Gospel Trumpet, La Trompeta has been an enduring encouragement to Cuban Christians for more than sixty years. Introduced by missionary Faith Stewart in 1935, the Church of God movement was well established in Cuba in 1959 when the Revolution defeated the Batista regime and new leaders declared a moratorium on foreign missionaries. Today the number of evangelical Protestant church groups on the island is tiny in comparison to the rest of Latin America. Cuban Christians, like their Latin counterparts, are hungry for sound Biblical teaching. Yet, they have little personal contact with fellow believers outside the country. Scant Internet access means they have limited ability to communicate or study via cyberspace. 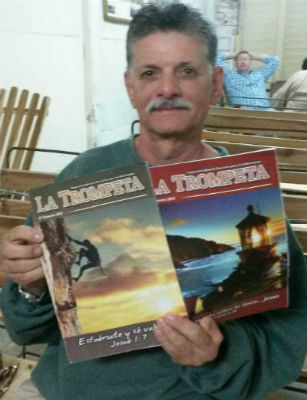 As a result, print media like La Trompeta magazine have been the principle source of teaching and information for Cuban Christians. The Church of God has had the unique opportunity, and a solemn responsibility, to witness to the transforming power of Jesus through print media. Unlike other Latinos, Cuban readers receive the magazine for free, due to the fact that the subscription cost is roughly equivalent to a month’s wages for the average worker. Generous sponsors from Ohio, Michigan, Colorado, Oregon and other parts of the United States provide La Trompeta to readers in Cuba. During my tenure as editor of the magazine, I noted that about half of the letters that arrived from Cuba were written by Christians outside the Church of God movement, a testimony to the broad impact it has had there. Interested in getting involved with this important work of the Church of God that reaches into Cuba? Consider an online donation to La Trompeta Latin America Publications, Project #42.30335. You can also send your donation to Church of God Ministries, PO Box 2420, Anderson, IN 46018. Be certain to clearly designate your gift to Project #42.30335. Thank you. Learn more about Global Strategy at www.chogglobal.org. This entry was posted in All Church of God, Global Strategy and tagged Cuba, David Miller, Faith Stewart, global, international, La Trompeta, Latin America, magazine, missions. Bookmark the permalink.